Leverage the world's first AI-driven, enterprise SEO platform that delivers actionable insights faster than the speed of thought. Make your team look like seasoned SEO pros when you see trends and prioritize tasks and execution with our machine-learning Actionable Insights. Leverage the largest, community-contributed keyword database that delivers the smartest insights with coverage of billions of keywords updated daily. 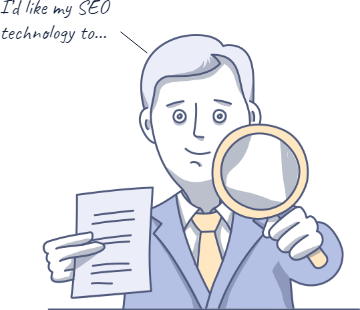 Conduct all of your research, find content collaborate through a single AI-driven, powerful enterprise SEO platform. You’ll never need another SEO tool. Understand your customer needs’ to optimize content for any topic faster than ever before with our AI-driven content writer. 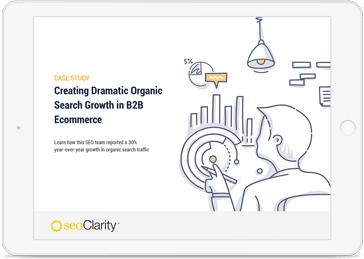 Centralize all SEO metrics when you streamline efforts, save time, and prove ROI with the only real-time SEO analytics reporting available. Trying to manage enterprise SEO through multiple point solutions is messy, time consuming, and frustrating. Misaligned teams and inability to scale your SEO will put your company at the mercy of your competitors. Instead you should be spending more time driving your search visibility to accelerate your results, increase rankings, traffic and customers. Is seoClarity a fit for my content marketing and SEO team? Start here! and they take up too much time. and I need more capabilities.